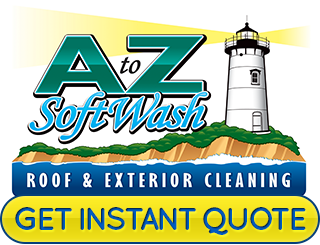 In the South Shore of Massachusetts and all through Cape Cod you will find all different degrees of worn shingles, and shingle finishes. In all cases when a cedar shingle is deteriorating it is due to it being eaten by a bacteria or algae. Most houses have different colored shingles on each side of the home; this is due to different sun and moisture exposures. These different exposures promote different types of growth. The side that is the most green is typically exposed to the most rain. The side that has the least sun is typically the darkest, this is the side covered in black looking bacteria. Also the black side is the one that has deteriorated the most, as the black bacteria is very damaging (same growth that causes streaks on roofs). The other color is usually gray, this is the good side! When it comes to any cedar shingle, gray is considered proper aging. It is merely UV degradation from the sun. It should be the goal for all cedar! 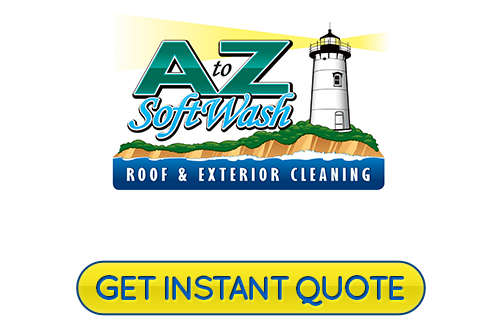 Our gentle Cape Cod non-pressure cleaning service will strip the growths from all cedar shingles, giving them the chance to age properly and allowing them to breathe which is of utmost importance. We don’t use a pressure washer due to cedar being a very soft wood. Too much pressure can literally blow infested shingles apart, also forcing water behind them which will only cause over saturation. While our process will only attack the living growths, it will also kill off all of the spores making the results last longer. South Shore Massachusetts and Cape Cod has homes with many different finishes. Some are stained, pre-dipped and even painted. We can treat all of these surfaces and also do a great job at prepping for the reapplication of their finish. If your home has fading stain our process will leave any existing stain intact while treating the faded areas allowing them to easily absorb new stain. Please note that cedar needs to be cleaned every 2 to 5 years depending on its varying degrees of exposures that promote algae growth. If your home has cedar shingle siding that hasn’t been cleaned in 15 years than it likely won’t look brand new after our process. It will however look 90% better and on top of that it will make your shingles last longer. While the black algae deteriorates the shingles the most (typically), the green algae has the worst effect on looks post cleaning. Fungi grow under the algae and they cause ring shape permanent stains in some cases. It’s the type of stain that much easier on the eye than a green wall of algae and isn’t always there. Although I felt it was worth mentioning.